Multi-function accessory drawer can be used as a keyboard drawer, laptop docking station, or pencil drawer. This design combines a drop drawer front panel for use as a wrist rest when using a keyboard. The ventilated bottom shelf allows for air flow and heat dissipation when used as a laptop drawer. Enjoy the smooth sliding action of our ball-bearing drawer slides built for durability and longevity. The Multi-purpose Drawer is a versatile accessory with a smart design that helps keep you organized. For use on many BBF Collections including Milano2, Quantum, 300 Series, Enterprise, Syndicate, Series A, Series C and Aspen Tables. 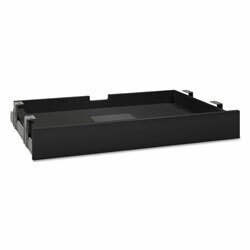 Color: Black; Overall Width: 27 1/8"; Overall Depth: 17 3/8"; Overall Height: 3 5/8". Packaging contains 65% post-consumer recycled content. Black Office Desk Drawers from Bush! 27 In Stock today.